I got a new cookbook last week. That in itself is not news worthy at all - as my husband will attest to. "Mr Amazon" visits us all to regularly - not always with cookbooks - but quite often. But this week's has really wowed me. I have already made 5 recipes from it and every one has been delicious. The book is by David Frenkiel and Luise Vindahl from the Green Kitchen. 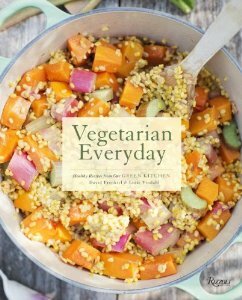 In the US it is called Vegetarian Everyday and in the UK and Europe it is called The Green Kitchen. I much prefer the UK cover. Anyhow - the recipes inside are the same. The first recipe I tried was Orange-kissed seed crackers. What a beautiful name for a cracker - and I tell you - in my orange mood - the delicate orange kiss is delightful! I chose the cracker recipe as a test. I try making lots of different seed cracker recipes from blogs and cookbooks but am always disappointed with the outcome. I've tried creating my own seed cracker recipe - wanting to use flax, chia or hemp seeds for omega-3 fatty acids - but they haven't ever been great. But this one is yummy. I'm making it again to take with me on my travels. Crunch and that tangy sweetness of the orange. Absolutely delicious. I didn't have amaranth flour that the recipe calls for so I used millet flour instead. I served them to my friends on Saturday who came round for lunch with the red pepper and rosemary spread and also the sage and walnut pate. More about them in another post. 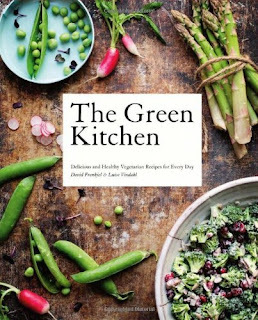 The authors have a blog called Green Kitchen Stories - which I know you'll enjoy. David is Swedish and Luise is Danish. They live in Stockholm and neither of them are chefs - but sure do create lovely recipes. The photography - by David - is gorgeous - and it is such an attractive book, it could be a coffee table book - but I know it'll get far too much use to sit on a table! Some of the recipes are quick and simple and some are more complicated. Some are vegan, some include eggs or dairy, some are gluten free. But I bet all are delicious! My first 5 definitely were! They also have a couple of apps of recipes - one general and one desserts....They are making me think I should upgrade my phone, just for the recipes! Anyhow, as you've probably realized, I highly recommend this book. I'll post some photos of my creations from their book over the next couple of days so you can be inspired. If you buy it, let me know what recipes you try!